But first things first…when talking about 5-axis machine configurations, I always begin by clarifying the correct definition of each of the rotary axes. Often times, when discussing a particular machine type, people will refer to the rotary axes incorrectly…so I like to use this as an opportunity to teach! If you think about the linear axes of the machine in alphabetical order (XYZ), you can also think about the rotary axes in the same manner (ABC). 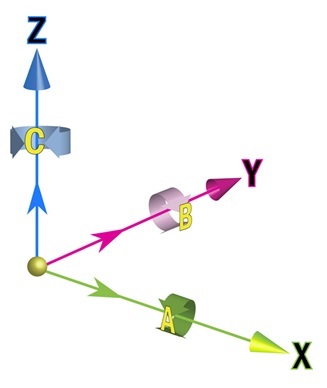 The A-axis always rotates around the X-axis, the B-axis always rotates around the Y-axis, and the C-axis always rotates around the Z-axis. This is true, regardless of the machine configuration or machine tool builder. 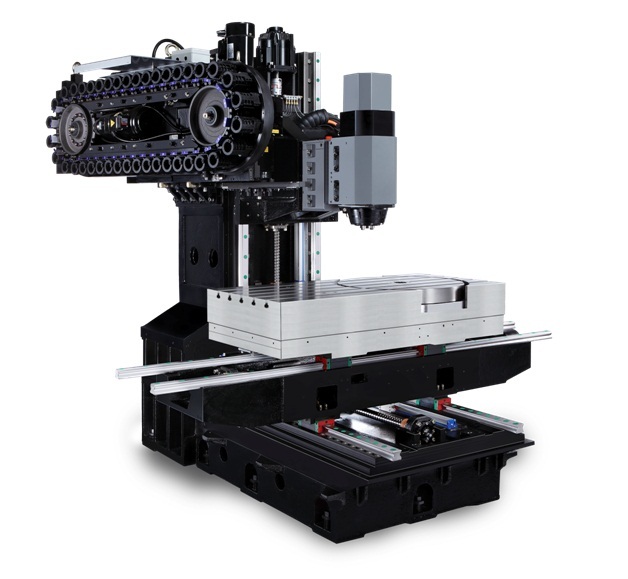 One of the most common configurations – or at least the one most people identify with the most when they hear the term “5-axis machine” – is the trunion table machine. The trunion configuration can also be referred to as a Table-Table configuration…because both rotary axes are contained in the trunion table itself, and the head is always stationary. Most operators and programmers can easily identify with this setup, because it is a simple process progression from standard 3-axis machining. Because the two rotary axes are often used to simply locate the workpiece into a desired orientation, it is easy to visualize how the machine will position and behave during machining. Often times the trunion machine will offer better undercut capabilities than other machine configurations, because the table can tilt farther (at least in one direction) than the swivel head designs…110 degrees in the example machine above…providing more access to the underside of a part. The trunion configuration can also give the operator a larger overall usable work volume – because the table simply tilts and locks into position, providing the XYZ axes their full range of travel. In a swivel head machine design, some of the overall work envelope must be utilized to accommodate the length of the tool as the head tilts back and forth. This scenario can be magnified when machining with longer tools, which can impact the overall work envelope tremendously. 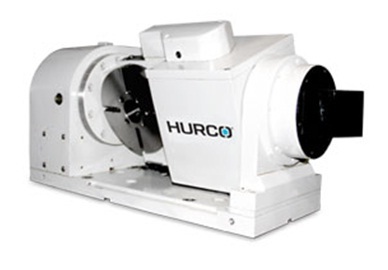 The trunion style of machine can also be a better choice for heavy metal removal. Due to the fact the head doesn’t articulate, therefore allowing the use of geared or belt driven spindles, this machine type will usually offer more torque at lower RPM’s. This stationary head design will also eliminate the possibility of pushing the head out of position while machining…that can sometimes happen on swivel head machines during heavy cuts. The next machine configuration we should discuss is the swivel, or articulating head machine. This type of machine can be either a head-head configuration, where all rotations are completed by the head, and the table is stationary; or the head-table configuration that consists of a tilting head and a rotating table. 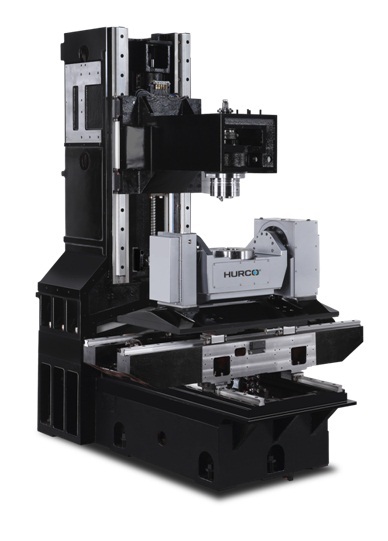 Below is a Hurco VMX42SRTi machine, which is a head-table design. This head-head, or head-table design will often allow you to machine much heavier parts than the trunion design. Because the table doesn’t tilt, the entire weight of the part is transferred directly down though the base of the machine and onto the floor…making this a very rigid setup for larger parts. Also, the design of the table itself – in contrast to the trunion style machine – allows for larger parts in general as well, regardless of weight. The trunion is limited by the size of the part that can be placed between the table risers. Furthermore, the rotating head allows for the use of shorter or more standard length tooling when machining, because all rotations of the tool happen above the part. On a trunion style machine, the spindle has to reach out over the tilting table…and the closer the table tilts toward 90 degrees, the more the spindle has to reach. This will often cause the operator to use longer than desired tooling, to accommodate for this scenario. This also means that when purchasing a trunion style machine, you really need to think about the size of the work you will be running on the machine, and size it accordingly…the smaller the work, the smaller the machine. As you can see by the picture above, the head-table design can be more versatile than a trunion or head-head type of configuration. In addition to 5-axis work, the whole table can be utilized for multiple vise setups, for plate work, or for machining the 6th side of the part (in preparation for a 5-axis setup) when machining in 3-axis mode. A tombstone can even be utilized on the C-axis table to simulate a horizontal machine setup, for better chip control, or to allow for more parts to be machined in one setup. In addition to the dedicated 5-axis machine configurations discussed above, there are also a large number of “add-on” 5-axis tables available that can be added to existing 3-axis machines for increased productivity. Although somewhat limited in the size of work that can be run, these add-on’s can be a fantastic way to improve efficiency. Most controls, like the Hurco WinMax control, can be adapted very easily to accept these add-on’s - but when being added to an existing machine, you definitely have to consider the age of the control technology on the machine, and whether it is worth the substantial investment that usually accompanies these tables.